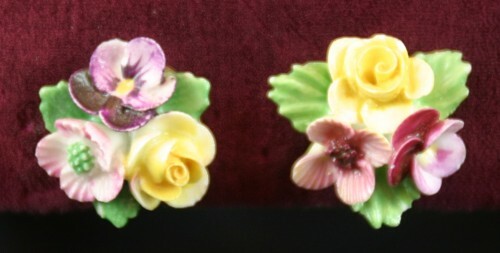 Floral porcelain earrings, marked both "Kildare China" and "Denton". Approx. 3/4 inches across with screw-on backs. The "Kildare Works Ltd" shows up only in the Longton (UK) directory for 1954. Since one of this pair of earrings has the Kildare mark while the other has the Denton mark - DENTON CHINA (LONGTON), Longton, Staffordshire, UK - it's thought that either Kildare was acquired by Denton or that Denton experimented with marking some items to show the particular works that manufactured them. Few of the "Kildare" marked items are still extent.